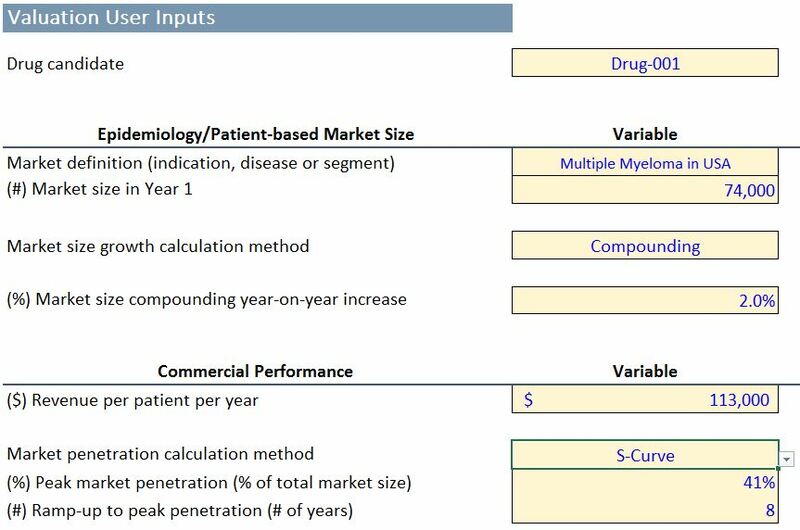 Valuation and forecasting for new drug candidates is critical in directing product strategy, attracting licensees, and communicating potential value to investors – but generic financial models are simply not equipped to handle the unique complexities associated with pharmaceuticals and biotechnology. 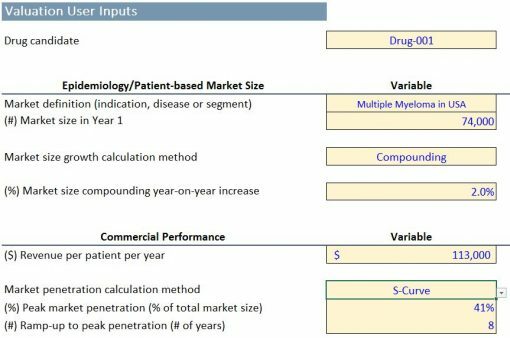 Now there’s a simple, automated, and customizable forecasting and valuation tool designed specifically for new drug candidates…. It is the best tool available for the unique financial modeling needed in the pharmaceutical and biotechnology industries. Easily forecast epidemiology (market size), market share, sales revenue, cash flow, profit and loss, and valuation (eNPV –expected net present value). Effortlessly calculate the financial value of new drug candidates at every year and phase of development. Compare the variables that most influence new drug candidate’s financial value such as price, market size, clinical trial length, FDA regulatory exclusivity, and cost of capital (discount rate). Contrast potential indications based on financial attractiveness. Preform multivariate sensitivity analysis to visualize the effect of numerous variables on R&D budgets, cash flow and financial valuation. Models also serve as the basis for licensing and M&A. The ease of use you’ll find with Easy eNPV is second to none. Our extensive testing provides you with intuitive input-controlled data entry, ensuring that you have entered the correct input. Step 5: P&L to net present value (NPV) – almost there! SAVE $299! Purchase Easy eNPV for just $950 (regularly $1,249) and it’s yours WITHOUT RESTRICTIONS! Once you purchase the Easy eNPV software, it is yours to use without restrictions for up to two users (5-user option also available at checkout), so you can conduct forecasting and valuation analyses for as many new drug candidates or technologies as you would like. No renewal or upgrade fees, no hidden costs — just unlimited use without expiration. This drug forecasting software is available to you for a limited time at the unbelievably low price of $950. It’s easier to use, more specific to pharma and biotech products, less expensive, and more robust than any other valuation product on the market.